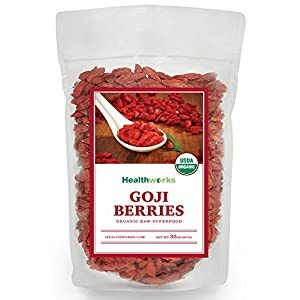 Just as delicious as they are nutritious: HealthWorks Certified Organic Goji Berries are soft and chewy berries that can be added to many recipes or enjoyed on their own for a Vegan-Friendly, Gluten-Free, and Low-carb option! Try with: Trail Mix, Oatmeal, Smoothies & Teas, Salads, or use a nutrient packed substitution for any recipe calling for dried cherries, cranberries or raisins. Vitamin packed: Goji Berries are the most nutrient dense superfood berries on Earth! They are loaded with essential amino acids, vitamins C and A, and high in protein and fiber. Additional vitamins and minerals include, but are not limited to: vitamins B, E and D and minerals such as copper, iron, magnesium, manganese, molybdenum, niacin, phosphorous, and potassium.